Department of Pharmacognosy, Institute of Pharmacy, Bundelkhand University, Jhansi - 284128, Uttar Pradesh, India. ABSTRACT: Kidney stones are a growing global problem. It is also known as Urolithiasis. 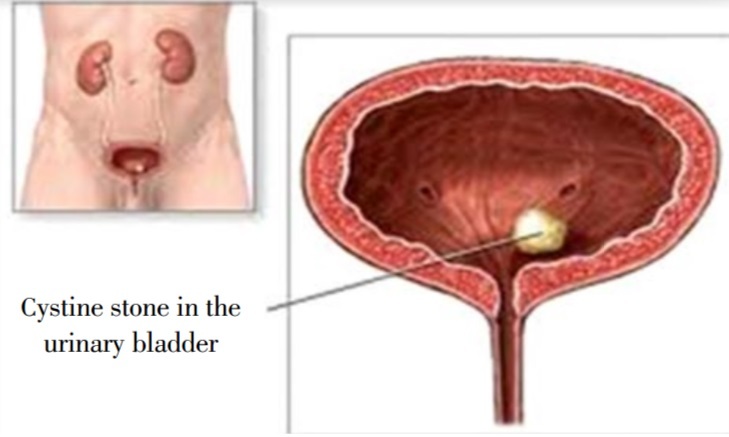 Lithiasis is a condition where urinary calculus is formed in the kidney and urinary tract. It is a complicated urinary disorder that has gravely troubled the health and quality of human life. 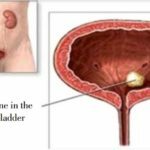 Urinary stones affect 10-12% of the population in industrialized countries. There are only a few geographical areas in which the stone disease is rare, e.g., Germany and in the coastal areas of Japan. Conventional agents are being used to control kidney stone along with lifestyle management. Medicinal plants are found to be useful in this metabolic disorder from ancient days due to its no or low-toxic nature, easily available in rural areas, cheap; there are fewer chances of recurrence. The purpose of this paper is to critically review the available literature on various medicinal plants with their antilithiatic activity and screening method of this activity to develop an effective drug to treat the disease. 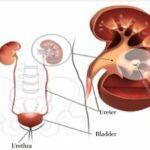 INTRODUCTION: Lithiasis is the formation of calculi (stone) in the kidney and urinary tract that prominently causes a variable degree of pain in abdomen and the groin, bleeding from the urethra, pus in the urine, and further may lead to secondary infection. It is one of the most common afflictions found in humans 1. Urine analysis is one of the important factors in determining the type of crystals. Calcium oxalate stone is one of the major types which occupy about 75% of the total population. The management of this ailment mainly involves techniques like extracorporeal shock wave lithotripsy and percutaneous nephrolithotomy; however, the prevention of recurrence of stone formation is not assured. Besides, these treatments cause undesirable side effects such as hemorrhage, hypertension, tubular necrosis and subsequent fibrosis of the kidney leading to cell injury and recurrence of renal stone formation 2. However, these procedures are highly costly, and with these procedures, recurrence is quite common 3. Many remedies have been employed during the ages to treat urinary stones. In the traditional systems of medicines, most of the remedies were taken from plants, and they were proved to be useful though the rationale behind their use is not well established through systematic pharmacological and clinical studies except for some composite herbal drugs and plants. Pharmacotherapy can reduce the recurrence rate. The use of plant products with claimed uses in the traditional systems of medicines assume importance 4, 5. Clinical and Pharmacological Studies: In recent years, some proprietary composite herbal drugs have also been introduced for dissolving kidney calculi of which mention may be made Cystone and calculi 41. Saxifraga ligulate and Tribulus terrestris are the two common plant ingredients of both these herbs-mineral preparation. Ureteric calculus disappeared within 55 days of treatment with ‘Cystone’ a herbo-mineral composition 42. Cystone relaxes the detrusor muscles and promotes diuretics by its high content of natural mineral salts. 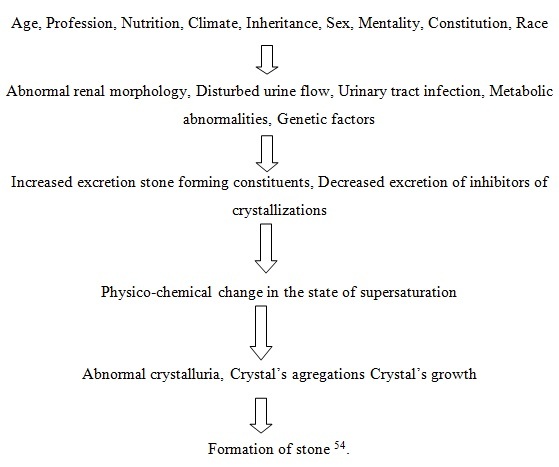 Cystone has also been found to be useful in urolithiasis, crystalluria and urinary tract infection in oral administration of other indigenous herbs-mineral drug calculi (2 TDS) in 40 cases of ureteric calculi, showed passing of disintegrated or intact stones through urine in 25 (68.85%) cases 43. Pharmacologically, Bergenia ligulata has shown no effect in preventing the stone formation but was found useful in dissolving zinc calculi in the urinary bladder in experimental rats 44. Varuna, Ghokhru, and Kulatha were found to be effective in preventing the deposition of the stones in experimental rats. Vataj and Pitiaj stones did not dissolve in varuva and kulatha. Gokhru decoctions dissolve urate and cystine stones to some extent. Kaphaj (phosphatic) stones were dissolving in all the three drugs. Among them, kulatha had marked (87%) dissolving activity and stones become friable 45. There are many herbal preparations described in ayurvedic a text in which kulatha is the main ingredient. It has been described as ashmarighana (destroyer of stones) by charak, Sushruta and other authorities. Sushruta mentions its efficacy in vataj ashmari with the characteristics of oxalate stone. Clinical investigations have been shown that out of fifteen cases urinary calculi, nine patients passed their stones within 8-10 days of treatment with Dolichos biflorus. Spontaneous passage of stones was common depending upon the size, site, and mobility of the calculus 46, 47. Role of Medicinal Plants as Antilithiatic Agents: Of late, there has been a growing resurgence and revival of interest in indigenous systems of medicine and traditional herbal remedies, which are regarded as quite safe with minimal or no side effects, cost-effective, readily available and easily affordable 48-51. Medicinal plants have been known for millennia and are highly esteemed all over the world as a rich source of therapeutic agents for the prevention of diseases and ailments 52. Interest in herbal drugs is growing due to their efficiency, low toxicity, and absence of side effects 53. People living in the interiors and inaccessible remote rural areas have excellent knowledge about the medicinal utility of the local flora. People in such areas have been traditionally using indigenous folk remedies to cure various diseases for generations and passing on this knowledge orally. Because of the prompt and positive effect of herbal treatment, they have strong faith in their folk medicinal preparations or crude formulations 50-53. A) Ethylene Glycol Induced Lithiasis in Rats: Chemically ethylene glycol is ethan-di-ol and is widely used as a solvent and automobile antifreeze agent 55. Mechanism of Action: Ethylene glycol is rapidly absorbed and metabolized in the liver via alcohol dehydrogenase and aldehyde dehydrogenase to glycol acid. This is oxidized to glyoxylic acid which is further oxidized to oxalic acid/oxalate by glycolate oxidase/lactate dehydrogenase, thus promoting hyperoxaluria. Hyperoxaluria is the major risk factor for lithiasis. Dose: 0.75% v/v in drinking water for 28 days. Method: Healthy male Wistar rats (120-200gm) are taken. They are divided into four groups containing six animals. Group-I served as control and given a vehicle for 28 days. Group-II, III, IV served as positive control, standard and test groups and were given ethylene glycol (0.75% v/v, p.o) for 28 days. Group-III and IV are given standard drug cystone (750 mg/kg, p.o) and test drug respectively for 28 days. On the 28th day, urine and serum of all the animals are collected, and all the required parameters are performed and compared 56. It is a widely accepted model of lithiasis for research as because, kidney being the most sensitive and principal target organ for ethylene glycol. Ethylene glycol is a widely available organic solvent. 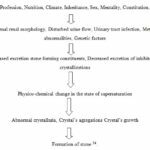 Modulates oxalate metabolism (oxalate metabolism is similar both in humans and rats) and deposits microcrystals. B) Diet Induced Model: Modified lithogenic diet consist of 30% lactose rich diet and 1% ethylene glycol. The 30% lactose rich lab diet contain 3.68% sucrose, 30% lactose, 23.4% protein, 10% fat, 5.3% crude fibre, 6.9% ash minerals [Ca (0.95%); P(0.67%); Mg (0.21%)]. Vit. A22 IU/g, vit. D 4.5 IU/g, vit. E 49 IU/g. Method: Healthy adult male Wistar rats of 150-200 gm are procured and divided into four groups. Group, I served as control and fed with regular lab diet. Group II, III, IV served as disease control, standard and test respectively and they were given a modified lithogenic diet (MLD) for 28 days. Simultaneously group III & IV are given standard drug and test drug respectively from day 1 to day 28 as a preventive regimen. Various biological samples are collected, measured and compared. It is a non- nephrotoxic model of lithiasis for research. Diet-induced lithiasis is an effective model as it produces stable crystal deposition 33. C) Induction of Lithiasis in Rats by Using Sodium Oxalate: Sodium oxalate induced lithiasis is an acute model used to study the activity of lithiasis caused by hyperoxaluria. Method: Healthy adult Wistar rats (120-200 gm) were a group obtained and randomly divided into four groups, each group containing six rats. Group I as control, Group II, III, and IV serves as positive control, standard and test groups respectively and injected with sodium oxalate 70 mg/kg i.p for 7 days, simultaneously III and IV group were given standard drug cystone 750 mg/kg p.o and test drug respectively from day 1 to day 7 as preventive regimen. Various biological samples were withdrawn from each rat and compared to obtain results 57. It is a reliable model and deposits microcrystals through driving force hyperoxaluria as such ethylene glycol. D) Zinc Disc Implantation induced Urinary Bladder Calculi Model: Male rats of wistar strain weighing 200-250 gm are used to study urinary calculi by zinc disc implantation. Rats were anesthetized with sodium pentobarbitone (40 mg/kg body wt, i.p). A suprapubic incision was made, and urinary bladder was exposed. A small cut was made at the top of the bladder, and a previously weighed sterile zinc disc (2 to 48 mg/kg) was inserted into the bladder, and the incision was closed with a single suture using absorbable catgut. The abdomen was closed in layers, and this was performed for each rat, and all the rats are recovered for one week. At the end of 28 days treatment, all the animals are measured for their different parameters and compared. This is a model that produces inflammation around the disc implanted area, i.e. ; it causes attached calculi. It is a non-nephrotoxic model. It avoids the sacrifice of animals at the end of the study. It is a risky model. It causes much more pain to the animal both due to insertion of the disc and also because of surgery 18. E) Xenoplantation Model: Stone particles were extracted by PCNL (percutaneous lithotomy) from one male patient with renal stones. The selected stone is cut with a blunt instrument into sections with a diameter of 2-3 mm, weighed and maintained in a sterile environment, before use. Eight-week old male rats weighing about 250-300 gm were selected and randomized into three groups: control, standard and test groups. The rats were anesthetics by intraperitoneal injection of sodium pentobarbital (50 mg/kg body weight), and a suprapubic incision exposed the bladder. Following this, a 4-5 mm incision was made at the top of the bladder, and one prepared stone particle was inserted in each rat, and then the bladder and the suprapubic incision was closed respectively. Ethylene glycol was supplied in drinking water at a final concentration of 1% from the second day (day 1) postoperatively for four weeks. After four weeks, kidney and urinary bladder were dissected, and the kidneys were dehydrated in a graded ethanol series and embedded in paraffin. The renal stone formation was assessed by von Kossa histochemical staining. Bladder stone was harvested, weighed and maintained in 75% ethanol for 24 h, before the stone being embedded in auto-polymerizing resin and sectioned transversely with the diamond wire saw to select the best section pane. Sectioned blocks were then fixed on a glass slide with thermoplastic glue and polished successively using a 1, 200 grit sandpaper and a mix of alumina polishing compounds (3, 1 and 0.3 µm) with a small volume of water until it was possible to observe the core clearly under a transmitted light microscope 58. F) Chemically Induced Lithiasis in Weanling Rats: Calculi is induced in the urinary tract of weanling Fischer-344 rats (postnatal day 28) in less than two weeks by exposure to terephthalic acid (TPA) at 3-5% in the diet or dimethyl terephthalate (DMT) at 1-3% of diet. Specified rats of 24 which randomly divided into four groups each group containing six rats. Group-I, II, III, and IV acts as control received vehicle, disease control (positive control) received (TPA)/(DMT) for two weeks, standard received (TPA/DMT) and cystone 750 mg/kg body weight p.o and the last group, e. IV serves as a test received (TPA/DMT) plus test drug. After the treatment period, various biological samples are collected and the parameters are measured and compared 59. Advantages: Weanling rats appeared to more susceptible to stone formation than adult rats. G) Sulfamonomethoxine-Induced Urinary Calculi in Pigs: Five Yorkshire-Durox cross-bred castrated pigs within a farrow-to-finish herd with 346 commercial crossbred pigs weighing 45-60 kg were used. They are started on a regimen of SMM (50 mg/kg body weight) orally twice a day. The affected pig’s medical history included streptococcal disease and toxoplasmosis, which were diagnosed in the third week and injected SMM (50 mg/kg body weight) once a day after toxoplasmosis was diagnosed 60. H) Mild Tubular Damage for Hyperoxaluric Rats induces Renal Lithogenesis: It is a two-step or two hit model of lithogenesis used to assess the antilithiatic activity of test drugs. In the first step, it is used to induce crystalluria (hyperoxaluria) which is a necessary step but not sufficient to induce lithiasis. In the second step, it causes tubular damage that induces lithiasis 61. In-vitro Crystallization: It is the time course measurement of turbidity changes due to the crystallization in artificial urine on the addition of 0.01M sodium oxalate solution. The precipitation o calcium oxalate at 37 ºC and pH 6.8 has been studied by the measurement of turbidity at 620 nm using UV/Visible spectrophotometer. Preparation of Artificial Urine: Sodium chloride 105.5 mmol/1, sodium phosphate 32.3 mmol/1, sodium citrate 3.21 mmol/1, magnesium sulphate 3.85 mmol/1, sodium sulphate 16.95 mmol/1, potassium chloride 63.7 mmol/1, calcium chloride 4.5 mmol/1, sodium oxalate 0.3 mmol/1, ammonium hydroxide 17.9 mmol/1, and ammonium chloride 0.0028 mmol/1. The AU was prepared fresh each time and pH adjusted to 6.0. Method: Four test tube was taken and transferred synthetic urine of 1 ml into each tube and labeled as control (1), negative control (2), standard (3) and test (4). Test tube 1 & 2 are added with 0.5 ml of distilled water, except test tube (1) all the test tubes are added with 0.5 ml of 0.05 M sodium oxalate and 3 & 4 test tubes are added with standard drug and test drug respectively. Test tube is left to stand for 10 min immediately after 10 min the absorbance was measured in UV-Spectro-photometer at 620 nm and compared. Microscopy of urine can also be done using a light microscope with the objective of 40 X eyepiece of 10 X 40. CONCLUSION: As there is no proper medicine in Allopathy for the management of anti-lithiasis and also the surgical treatment has the more chances of recurrence, these two factors particularly diverted the large population toward the use of herbal medicines. Medicinal plants have wide acceptance due to a large number of advantages such as lesser toxic effects safe, effective, cheap (cost effective), fewer chances of recurrence of disease, easily available in rural areas. The present paper provides information regarding the potential medicinal plants used in the management of anti-lithiasis and also about the screening models of anti-lithiasis in order to develop a new drug for the management of anti-lithiasis to overcome the various disadvantages faced by the wide range of population nowadays and get relieved from the disease. Let us hope for the development of the safe and effective drug for the management of anti-lithiasis. ACKNOWLEDGEMENT: The authors thank Prof. Dr. S. K. Prajapati, Head of Department of Institute of Pharmacy, Bundelkhand University. The authors also thankful to Mr. Pankaj Kumar Niranjan and Dr. Shashi Alok for his valuable suggestion during the work. Murugan VM and Satishkumar A: Effect of lanata leaf extract and Vediuppu chunnam on the urinary risk factors of calcium oxalate urolithiasis during experimental hyperoxaluria. Pharmacol Res 2001; 43: 89-93. Bhaskar VH and Shelke TT: Lithiasis: causes, evaluation and International Journal of Research in Pharmaceutical and Biomedical Sciences 2012; 3(2): 468-474. Prasad K, Sujatha D and Bharathi K: Herbal drugs in urolithiasis- a review. Phcog Rev 2007; 1: 175-179. Narayanaswami V and Ali VS: Pashanabheda. J Res Indian Med 1967; 1: 24. Bahl and Seshadri: Advances in research in “Indian Medicine”, “Pashanbedi” drugs for urinary calculus, Udupa, K.N. (Eds), 1970: 77-98. Christina AJM and Muthumani P: Phytochemical investigation and antilithiatic activity of Abelmoschus moschatus medikus. International Journal of Pharmacy and Pharmaceutical Sciences, 2013; 1. Prathyusha JJMS, Mohanalakshmi S, Kumar AVSP and Kumar CKA: Potent herbal wealth with litholytic activity: A Review. Int J Inn Drug dis 2012; 2(2): 66-75. Alok S, Jain SK, Verma A, Kumar M and Sabharwal M: Pathophysiology of Kidney, gall bladder and urinary stones treatment with herbal and allopathic medicines: A Review, Asian Pac J. Trop Dis 2013; 3(6): 496-504. Christina AJ, Ashok K and Packialashmi M: Antilithiatic effect of Asparagus racemosus wild on ethylene glycol-induced lithiasis in male albino Wistar Exp Clin Pharmacol 2005; 27(9): 633-638. Ahmed MM and Singh PK: Traditional knowledge of kidney stones treatment by Muslim Maiba (herbalists) of Manipur, India. Not Sci Bio 2011; 3(2): 12-15. Ankur C, Amarchand P, Aadarsh C, Deepa I, Pawar RS and Patil UK: Potential of medicinal plants in kidney, gall and urinary stones. Int J Drug Develop and Res 2010; 2(22): 431-447. Lokendrajit N, Swapana N, Singh CD and Singh CB: Herbal folk medicines used for urinary and calculi/stone cases complaints in Manipur. Ne BIO 2011; 2(3): 1-5. Tiwari A, Soni V, Londhe V, Bhandarkar A, Bandawane D and Nipate S: An overview on potent indigenous herbs for urinary tract infirmity: urolithiasis. Asian J Pharm Clin Res 2012; 5(1): 7-12. Pareta KC, Patra SK, Mazumder PM and Sasmal D: Prophylactic role of Boerhaavia diffusa in ethylene glycol induced calcium oxalate urolithiasis. Af J Urol 2011; 17(2): 28-36. Ashalata DK, Khan ML and Tripathi RS: Ethnomedicinal plants in the sacred groves of Manipur. Indian Journal of Traditional Knowledge 2005; 4(1): 21-32. Ahmad A, Garg R and Sharma S: Evaluation on Antiurolithiatic activity of Bryophyllum pinnatum of rats. Int J Pharm Sci Health Care 2013; 6(3): 11-15. Yumnam JY and Tripathi OP: Traditional knowledge of eating raw plants by the Meitei of Manipur as medicine/ nutrient supplement in their diet. Indian Journal of Traditional Knowledge 2012; 1: 45-50. Kalpeshisinh SC, Kumar NFr, kirti VP, Kalpana GP and Tejal EG: Effect of flavonoid-rich fraction of Citrus medica on ethylene glycol induced urolithiasis in rats. J drug Deli Therapy 2012; 2(4): 109-116. Venkatesh G, Baburao K, Babu MR, Dhanalakshmi S and Priyadarshini GI: An antiurolithiatic and antihyperlipidemic activity of Coleus aromaticus- An explanation of the underlying mechanism. Int J Phytomed 2010; 284-291. Mekap SK, Mishra S, Sahoo S and Kumar PP: The antiurolithiatic activity of creteve magna Lour bark. Indian J Nat Prod Resources 2010; 2(1): 28-33. Imotomba RK and Lisham SD: Creation of geo-spatial data base of medicinal plants of senapati Manipur National Journal of Chembiosis 2011; 2(2): 17-36. Ratnam KV, Ravishankar K and Kiranmayi GVN: Evaluation of diuretic and antiurolithiatic activities of ethanolic root extracts of curculigo orchioides. Int J Biol Pharm Res 2011; 4(12): 902-906. Nigombam DS, Devi SP, Singh PK, Pinokiyo A and Bisheswori T: Documentation and assessment on knowledge of ethno-medicinal practitioners. A case study on Local Meetei Healers of Manipur. IOSR Journal of Pharmacy and Biological Sciences 2014; 9(1): 2278-3008. Sharma N, Tanwer BS and Vijayvergia R: Study of medicinal plants in Aravli regions of Rajasthan for treatment of Kidney stone and Urinary tract troubles. Int J Pharmatech Res 2011; 3(1): 110-113. Singh RY, Onita DCH, Singh SKA and Chetia D: Study on the Ethnomedicinal system of Manipur. International Journal of Pharmaceutical and Biological Archives 2012; 3(3): 587-591. Ashalata DK, Khan M and Tripathi R: Sacred groves of Manipur, northeast India. Biodiversity value, status and strategies for their conservation. Biodiversity and Conservation 2005; 14: 1541-1582. Yadav RD, Alok S, Jain SK, Verma A, Mahor A, Bharti JP and Jaiswal M: Herbal plants used in the treatment of urolithiasis: A Review Int J Pharm Res & Res 2011; 2(6): 1412-1420. Sathish RK, Natarajan and Nikhad MM: Effect of Hygrophila spinosa anders on ethylene glycol induced urolithiasis in rats. Asian J Pharm Clin Res 2010; 3: 4. Gilhotra UK and Christiana AJM: An antilithiatic activity of kalanchoe pinnata on 1% ethylene glycol induced lithiasis in rats. Int J Pharm Sci Rev Res 2011; 10(1): 187-192. Takawale RV, Mali VR, Kapase CU and Bodhankar SL: Effect of Lagenaria siceraria fruit powder on sodium oxalate induced urolithiasis in wistar J Ayu Int med 2012; 3(2): 75-79. Yoirentomba MS and Singh PK: Survey for medicinal plants of Thoubal district, Manipur. Flora and Fauna 2007; 13(2): 355-358. Nanda Y, Nengnunnem S and Rao NA: Ethnomedicinal plants of Thadou tribe of Manipur (India)-1. Pleione 2013; 7(1): 138-145. Vidhya G, Sumithra G, Anandhan R and Anand G: antiurolithiatic activity of Nardostachys jatamansi D C on Modified Lithogenic Diet-induced urolithiasis in rats. Int J Adv Pharma Gen Res 2013; 1(2): 52-63. Butterweck V and Khan SR: Herbal medicines in the management of urolithiasis: Alternative or complementary? Herbal Med Plants Med 2009; 75: 1095-1103. Vyas BA, Vyas RB, Joshi SV and Santani DD: The antiurolithiatic activity of whole plant hydroalcoholic extract of pergularia daemia in rats. J Young Pharm 2011; 3(1): 36-40. Divakar KAT, Pawar SB, Chandrashekar SB and Divakar DG: Protective effect of the hydroalcoholic extract of Rubia cordiofolia roots against ethylene glycol induced urolithiasis in rats 2010; 48: 1013-1018. Ridip H, Singh SKA and Neog B: Ethnomedicinal studies of Common Plants of Assam and Manipur. International Journal of Pharmaceutical & Biological Archives 2012; 3(4): 809-815. Warjeet LS and brajeshwari DK: Studies on chemical constituents and antioxidant activities of extracts from the roots of Smilax lanceaefolia Nat Prod Res 2010; 24: 1168-1176. Parmar RK, Kachchi NR, Tirgar PR, Desai TR and Bhalodiya PN: Preclinical evaluation of antiurolithiatic activities of Swertia chirata Int Res J Pharm 2012; 3(8): 198-202. Kumar GP, Arun M and Rishi K: Evaluation of Tinospora Cordiofolia for antiurolithiatic J Pharm Biomed Sci 2011; 9: 14. Jehti RK, Duggal B, Sahota RS, Gupta M and Sofat JB: Important plants used in stone. India J Med Res 1983; 78: 422-425. Muthusamy VV and Muthu P: Usefulness of history- taking a physical examination and diagnostic scoring in acute renal colic, Prove 1980; 19: 130-131. Yadav JK, Singhvi AN and Sharma N: Indigenous herbomineral drug calculi. Med Surg 1981; 21: 15-18. Seth SDS, Prabhakar MC, Bupha BC and Arora RB: Berginia ligulata as an antilithiatic. J Res Indian Med 1974; 9: 1-3. Kumar P, Despande PJ and Singh LM: Kidney stone is dissolving drugs. Bull Med Ethanobot Res 1981; 2: 277-284. Singh LM and Kumar P: Pharmaceutical preparations described in Ayurvedic texts. J Res Ind Med 1973; 8: 1-7. Havagiray RC, Shashi A, Jain SK and Sabharwal M: Herbal Treatment for urinary stones. International Journal of Pharmaceutical Sciences and Research 2010; 1: 24-31. Jain SK: Notable foreign medicinal uses for some plants of Indian Tradition. Indian J Traditional Knowledge 2007; 2(4): 321-332. Purohit AN: Medicines and Medicinal Plants-Past, Present and Future, In: Proc Natl Symp Plant Sci Res India: Challenges & Prospects, Dehradun 2005; 60-62. Purohit SS and Prajapati ND: Medicinal Plants: Local Heritage with Global Importance. Agrobios News Let 2003: 1(8): 7-8. Sinha RK: Ethnobotany- The Renaissance of Traditional Herbal Medicines. INA Shree Publishers, Jaipur 1996. Sharma A, Shanker C, Tyagi L, Singh M and Rao CV: Herbal Medicine for Market Potential in India: An Overview. Acad J Plant Sci 2008; 1: 26-36. Pifferi G, Santoro P and Pedrani M: Quality and functionality of excipients. Farmaco 1999; 54: 1-14. 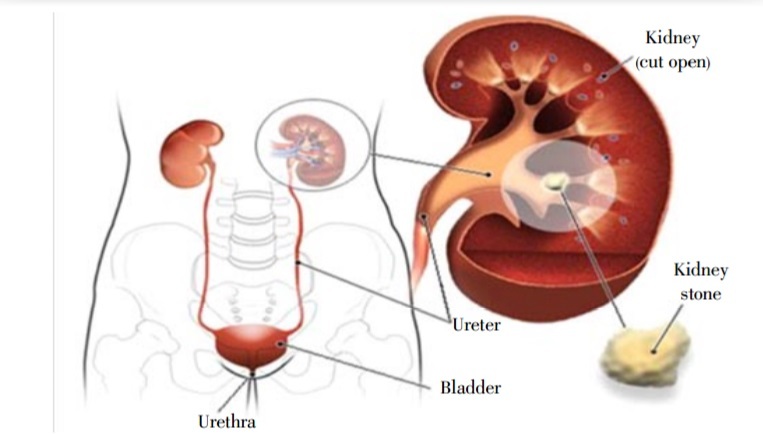 Alok S, Jain SK, Verma A, Kumar M and Sabharwal M: Pathophysiology of the kidney, gallbladder and urinary stones treatment with herbal and allopathy medicines: A review. Asian Pac. J of Trop Dis 2013: 3(6): 496-504. Saha S and Verma RJ: Efficacy of Dolichos biflorus in the management of nephrotoxicity. Asian Pac J Trop Biomed 2011; S1471-S1476. Shah BN, Raiyani KD and Modi DC: Antiurolithiatic activity studies of Momordica charantia fruits. Int J Pharm Res Tech 2011; 1(1): 06-11. Ramesh C, Kumar D, Einstein J and Girish S: The antiurolithiatic activity of Wood Bark of Cassia fistula in rats. J Pharm Biomed Sci 2010; 2: 12. Wang S, Qingquan X, Huang X, Jingxing L, Jingxing W and Wang X: Use of calcium tracer to detect stone increments in rat calcium oxalate xenoplantation Exp Therap Med 2013; 6(4): 957-960. Wolkowski RT, Chin TY, Popp JA and Heck HD: Chemically induced urolithiasis in wealing Am J Pathol 1982; 107(3): 419-421. Wei-Dong S, Zhang KC, Wang JY and Wang X: Sulfamonomethoxine induced urinary calculi in Pigs. World Acad Sci Eng Tech 2009; 3: 9-29. Gambaro G, Valente ML, Zanetti E, Barbera MD, Prete DD, Angelo AD and Trevisan A: Mild tubular damage induces calcium oxalate crystalluria in a model of subtle hyperoxaluria: evidence that a second hit is necessary for renal lithogenesis. J Am Soc Nep 2006; 17: 2213-2219. Chanchal DK, Niranjan P, Alok S, Kulshreshtha S, Dongray A and Dwivedi S: A brief review on medicinal plant and screening method of antilithiatic avtivity. Int J Pharmacognosy 2016; 3(1): 1-09. doi: 10.13040/IJPSR.0975-8232.3(1).1-09. Authors Address: Department of Pharmacognosy, Institute of Pharmacy, Bundelkhand University, Jhansi, Uttar Pradesh, India.